For several decades, cities throughout the nation have decided that a highly beneficial way to reduce town center traffic congestion, reduce truck traffic in the town center, and ease regional motor vehicle travel is to spend trillions to build a beltway highway at the periphery of the town center so that such traffic is diverted from the town center. While the idea is seductively a great idea, there are significant reasons why such beltways – or “ring” roads – are ruinous for a community. First, it is unquestionably true, in my opinion, that trying to solve in-town congestion “problems” with a beltway highway system that by-passes the town center is extremely counterproductive. Such roads inevitably accelerate flight from — and therefore strongly contribute to the death of — a town center. This beltway destruction of town centers has occurred throughout the U.S., primarily because beltways remove vehicle trips (trips which provide life-giving potential customers) from a town center, and promote the construction of big box retail malls with big parking lots in outlying suburban locations that feed on regional customers and in-town customers. These potential customers diverted from the town center are now able to find easy car access to suburban shopping due to the beltway. Second, beltway highways, in an urban area that already faces traffic congestion “problems,” will inevitably become congested themselves, almost overnight, due to the unavoidable Triple Convergence (see Anthony Downs book, Stuck in Traffic). This is now extremely well-documented. This problem happens primarily because added highway capacity attracts new car trips that would have not happened had the capacity not been added. As Walter Kulash says, widening roads [or in this case, adding a new highway] to solve traffic congestion is like loosening your belt to solve obesity problems. Third, town centers need congestion to be healthy. I recall the old saying from Yogi Berra: “The place became so crowded that no one would go there anymore.” “Lots of cars” is not a problem for a town center — if car traffic is managed properly. Town centers need those customers arriving by car. What a town center needs is well-behaved cars. Tactics such as traffic calming, narrow streets, wide sidewalks, on-street parking, fee-based parking, good transit service, high residential density, and transportation choices all help deliver well-behaved cars. When I see research concluding that road widenings or new highways do notdetermine the resulting development in the region, I assume the research is coming from people with vested interests, since it is blatantly obvious that transportation modifications such as road widening and new highways are, by far, the key driving force to land use development patterns and suburban sprawl. In other words, either the researcher has personal views or lifestyle that does not allow him or her to conclude that widenings drive land use, or has financial interests that dictate that this not be admitted. In sum, I cannot think of a more wrong-headed, counterproductive way to use large amounts of public dollars than to widen roads or build new “beltway” highways. We desperately need to escape the now discredited paradigm of “building our way out of congestion” before we ruin our cities even more. 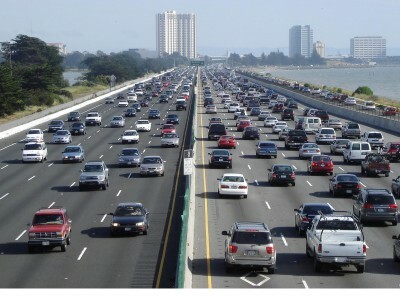 The State of Florida pioneered a seemingly beneficial rule that stated a new development could only be permitted if sufficient road capacity was available to absorb the new car trips that would be created by the proposed development. Sounds wonderful, right? After all, how many of us have been stuck in traffic and cursed the local government for allowing new development without ensuring that the road system was adequate to handle the car trips from the new development? A few mistaken assumptions are perpetuated by this seemingly desirable rule. First, it perpetuates the myth that it is necessary to maintain or improve road capacity at all costs as a way to retain or promote quality of life. Such thinking is seductive, because, after all, even progressives are against congested roads. However, the counterintuitive reality is that “free-flowing traffic” undercuts quality of life. This is because when car travel is eased in this way, more per capita car trips are created (particularly “low-value” car trips). Creating more car trips reduces the ability to safely or conveniently travel by walking, bicycle or transit. More car trips increases noise pollution and degrades residential quality of life. More car trips significantly increases household costs and therefore reduces housing and household affordability. Ease of car travel increases average car speeds, and increases the instances of dangerously inattentive driving. But the most catastrophic, unintended consequence of this rule is that the rule powerfully promotes suburban sprawl. Why? Because in-town development, where new development tends to be preferred from a smart, compact development point of view, is significantly discouraged by the fact that in-town locations generally do not have any available road capacity for adding new car trips. The places in a community that tend to have available road capacity? The result of this state of affairs is that new development is made much less costly in sprawl locations and impossibly expensive for in-town locations. A needed reform that Florida adopted, as a result of this unintended consequence, was to create “transportation concurrency exemption areas (TCEAs). By setting up such areas, the State granted local governments the ability to exempt new developments from road concurrency rules in places where new development was desired – such as in-town infill locations. The important caveat, however, is that in my view, there must be meaningful design rules in place before the reward of transportation exemption is granted. Otherwise, developers are able to build “business as usual” projects that are car-dependent. Developments that will, in other words, create relatively large numbers of per capita or per household car trips. What design requirements should we require to ensure that new development in these exemption areas delivers walkable, transit-conducive development, rather than drivable sprawl design? 1. First, the area that is exempted from road concurrency must be relatively small. By keeping the area small, the community is able to adopt relatively high-quality, meaningful design requirements for new development. If too large of an area is exempted, such rules must be watered down to avoid being excessively onerous. 2. Within the road concurrency exemption area, allow no net increase in road capacity. No new travel lanes or turn lanes should be allowed. This is because widening a road strongly promotes car trips and strongly discourages walking, bicycling or transit trips. 3. Instead of requiring car parking in the road concurrency exemption area, convert the former minimum parking rule into a maximum parking rule (a parking exemption that takes the position that too much parking is much worse than too little parking). Again, providing abundant and free car parking undercuts the essential objective of reducing car trips (parking is a fertility drug for cars). 4. Require frequent transit service in the road concurrency exemption area — say, a 10-minute transit frequency. 5. Do not allow drive-throughs in the road concurrency exemption area. 6. If a project is over, say, 5 dwelling units or 10,000 square feet, require that buildings be at least 2 stories high. 7. Allow no new cul-de-sacs, unless it is infeasible to do otherwise. Street connectivity must be extremely high. 8. To promote proximity, require that the development provide meaningful mixing of residences with offices, civic, jobs, recreation and retail shops. There should be a minimum number of residential units per “X” square feet of non-residential floor area. 9. Require the fronts of commercial buildings (the building façade) to abut the streetside sidewalk or otherwise be 0-20 feet from the front property line (for both streets if on a corner), and allow no car parking in front of the building. 10. Allow no block faces greater than 400-500 feet. 11. Require curb and gutter. 12. Provide each employee or resident in the project with a free transit pass. 13. Offer parking cash-out for employees in the new development, and unbundle the cost of parking from the cost of the residential units in the new development. What sorts of questions should be asked of candidates who are seeking to become the new fire chief in your community? Despite the conventional wisdom, it is not asking whether the candidate is familiar with the latest fire trucks. Or whether the candidate is courageous in putting out fires. No, the most essential questions center around whether the candidate has a philosophy that centers around the broader question of life safety, rather than the much more narrow question of fire safety. As shown by a study done by Peter Swift, widening roads (or keeping existing roads excessively wide) is often justified to promote fire safety, because it is claimed that wider roads reduce fire truck response times. But the Swift study conclusively showed that such wider roads result in less overall public safety, because the increases in injuries and deaths due to wider roads far exceeds the reduction in injuries and deaths due to faster response times. A key for public safety, then, is to not narrowly focus on a subcategory of safety (in this case, fire safety), but to instead aim to improve overall life safety. 1. What are your thoughts about reducing the size of fire trucks? This question is crucial because the now gargantuan size of trucks used in most cities means that our fire chief, perhaps more so than the traffic engineer, isprofoundly dictating — every time she or he decides to purchase a big truck — that our neighborhood and arterial streets will be monstrous in width in order to “safely” allow passage by the big trucks at high velocities. The (unintended?) result is more dangerous, high-speed community streets filled with reckless, inattentive drivers, and lower neighborhood quality of life. Why? Because motorists tend to drive at the highest speeds that can be driven while feeling safe and comfortable. And when streets are over-designed for excessive widths and other geometries, motorists are enabled to drive a higher speeds (as well as driving more inattentively). 2. What are your thoughts about reducing a bloated fire department budget? A bloated department budget sub-optimizes the services of that department and starves other important community services such as recreation, social services, environmental protection, and street design. 3. What are your thoughts about minimizing the use of emergency vehicle sirens? In nearly all cities, emergency vehicle sirens are out of control. 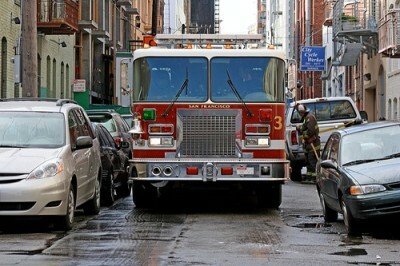 Sirens are used excessively because of irrational fear of crashes with cars, a hysterical fear of lawsuits, and the endless drive to reduce vehicle response times, not to mention the psychological benefits of importance, excitement and power that some firemen feel when they sound the fire horns as much as possible. Given these factors over the course of the past century, excessive siren use escalates continuously in a never-ending race to have the loudest and most frequently used fire sirens. Those of us who have experience living in a town center are more exposed than others to the jangled nerves associated with the 24/7 wailing of sirens, helicopters, flashing emergency lights, and racing emergency vehicles that bombard most all town centers. The experience of living in a town center, due to the out of control emergency vehicle problem, is one of feeling like you are living in a war zone. Due to the unpleasantness of such a state of affairs, many throw up their hands and flee to the expected peace and quiet of the suburbs, thereby undermining extremely important community objectives regarding the fight against sprawl. If communities (justifiably) strive to encourage more downtown residential development, why are we chasing folks out of downtown by creating a sleep depriving, frenzied, stressed ambience downtown? True leadership means insisting that fire chiefs abide by over-arching community objectives such as public safety and quality of life. For fire chiefs, that means that the person a community hires must be someone who enthusiastically supports the need for smaller fire trucks, a more modest fire department budget, and a significant reduction in siren use.